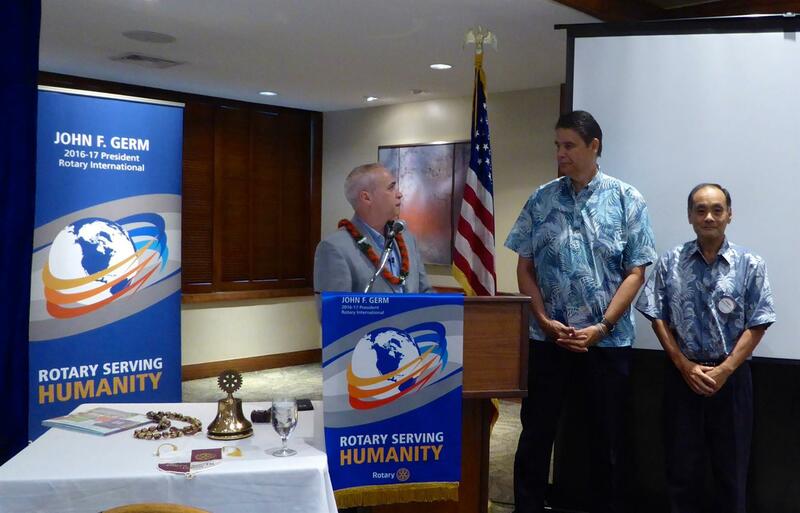 The Rotary Club of Honolulu Sunrise welcomed Clint Schroeder, District Governor 2016-17, District 5000 Hawaii to our meeting for his 2016-2017 kick-off remarks, induction of a new member, Allan Silva, and challenge to our members to support Rotary's End Polio Now campaign (Polio Plus) project, support the 100 year anniversary of the RI Foundation, and engage, enjoy, share, and introduce Rotary with our business associates and friends as an opportunity to "Serve Humanity". Today we welcomed guests from Tokyo South Rotary Club. Congratulations Hale Takazawa on a great meeting # 2 for your year as President! Great to welcome Honorary member Wally Amos Wally Amos "The Cookie Kahuna" to our meeting this morning!